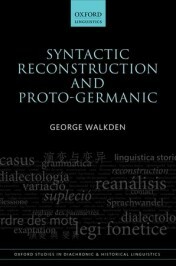 This book offers reconstructions of various syntactic properties of Proto-Germanic, including verb position in main clauses, the syntax of the wh-system, and the (non-)occurrence of null pronominal subjects and objects. It’s fairly common knowledge that languages, like people, have families. English, for instance, is a member of the Germanic family, with sister languages including Dutch, German, and the Scandinavian languages. Germanic, in turn, is a branch of a larger family, Indo-European, whose other members include the Romance languages (French, Italian, Spanish, and more), Russian, Greek, and Persian. Being part of a family of course means that you share a common ancestor. For the Romance languages, that mother language is Latin; with the spread and then fall of the Roman empire, Latin split into a number of distinct daughter languages. But what did the Germanic mother language look like? Here there’s a problem, because, although we know that language must have existed, we don’t have any direct record of it. 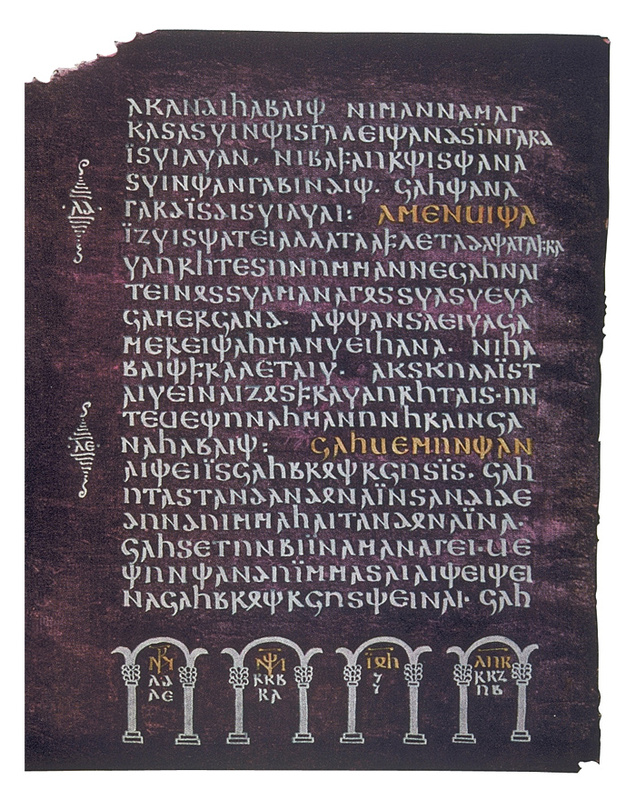 The earliest Old English written texts date from the 7th century AD, and the earliest Germanic text of any length is a 4th-century translation of the Bible into Gothic, a now-extinct Germanic language. Though impressively old, this text still dates from long after the breakup of the Germanic mother language into its daughters. How does one go about recovering the features of a language that is dead and gone, and which has left no records of itself in spoken or written form? This is the subject matter of linguistic necromancy – or linguistic reconstruction, as it is more conventionally known. The enterprise, dubbed “darkest of the dark arts” and “the only means to conjure up the ghosts of vanished centuries” in the epigraph to a chapter of Campbell’s historical linguistics textbook, really got off the ground in the 1900s due to a development of a toolkit of techniques known as the comparative method. Crucial to the comparative method was a revolutionary empirical finding: the regularity of sound change. Though it has wide-reaching implications, the basic finding is simple to grasp. In a nutshell: it’s sounds that change, not words, and when they change, all words which include those sounds are affected. Detail of a page from the Codex Argenteus. Public domain via Wikimedia Commons. If the forms of words simply changed at random, these systematic correspondences would be a miraculous coincidence. However, in the light of the regularity of sound change they make perfect sense. Specifically, at some point in the early history of German, the language sounded a lot more like (Old) English. But then the sound p underwent a change to pf at the beginning of words, and all words starting with p were affected. There’s much more to be said about the regularity of sound change, since it underlies pretty much everything we know about language family groupings. (If you’re interested in finding out more, Guy Deutscher’s book The Unfolding of Language provides an accessible summary.) But for now let’s concentrate on its implications for necromantic purposes, which are immense. If we want to invoke the words and sounds of a long-dead language like the mother language Proto-Germanic (the ‘proto-’ indicates that the language is reconstructed, rather than directly evidenced in texts), we just need to figure out what changes have happened to the sounds of the daughter languages, and to peel them back one by one like the layers of an onion. Eventually we’ll reach a point where all the daughter languages sound the same; and voilà, we’ve conjured up a proto-language. There’s more to living languages than just sounds and words though. Living languages have syntax: a structure, a skeleton. By contrast, reconstructed protolanguages tend to look more like ghosts: hauntingly amorphous clouds of words and sounds. There are practical reasons why the reconstruction of proto-syntax has lagged behind. One is simply that our understanding of syntax, in general, has come a long way since the work of the reconstruction pioneers in the 19th century. Another is that there is nothing quite like the regularity of sound change in syntax: how can we tell which syntactic structures correspond to each other across languages? These problems have led some to be sceptical about the possibility of syntactic reconstruction, or at any rate about its fruitfulness. Nevertheless, progress is being made. To take one example, English is a language that doesn’t like to leave out the subject of a sentence. We say “He speaks Swahili” or “It is raining”, not “Speaks Swahili” or “Is raining”. Though most of the modern Germanic languages behave the same, many other languages, like Italian and Japanese, have no such requirement; speakers can include or omit the subject of the sentence as the fancy takes them. Was Proto-Germanic like English, or like Italian or Japanese, in this respect? Doing a bit of necromancy based on the earliest Germanic written records suggests that Proto-Germanic was, like the latter, quite happy to omit the subject, at least under certain circumstances.Of course the issue is more complex than that – Italian and Japanese themselves differ with regard to the circumstances under which subjects can be omitted. Slowly but surely, though, historical linguists are starting to add skeletons to the reanimated spectres of proto-languages. George Walkden is a Lecturer in the Department of Linguistics & English Language at the University of Manchester. His recently-completed PhD was carried out at the University of Cambridge (Clare College) under the supervision of David Willis. He is also the founding editor of the Historical Syntax online section of the Linguistic Society of America's flagship journal Language. He recently published Syntactic Reconstruction and Proto-Germanic.